Mix all the ingredients for the marinade and pour into a vacuum bag and add the chicken, Seal the bag. Let the chicken marinate overnight. Skewer the chicken wings. Cut the cucumber and white radish in thin slices. Season with some oil, lime juice, red chili pepper and finely chopped coriander stems. Mix the Hellmann’s Real Mayonnaise with the chili sauce, lime juice and finely chopped coriander stems. 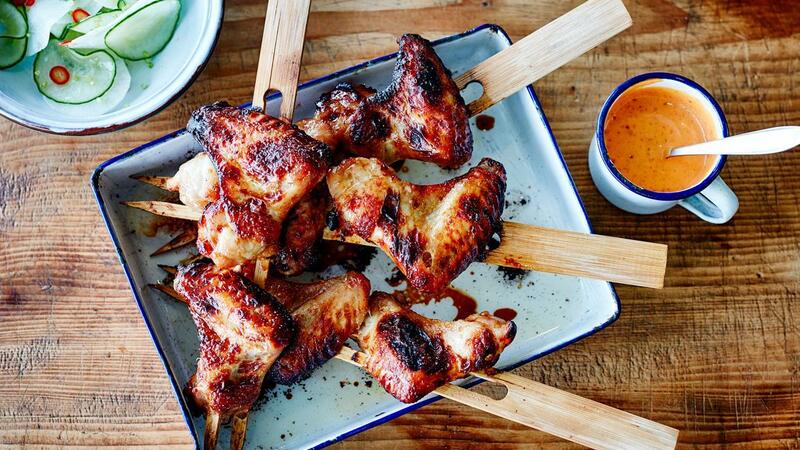 Light the charcoal BBQ and roast the chicken wings. Serve with the cucumber salad and the spicy chili mayonnaise.